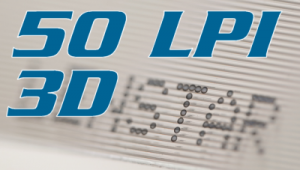 The 3D-50 LPI is extruded using the exclusive Lenstar®Plus resin. With its 41° viewing angle, this particular lenticular lens design allows for a greater depth effect and is therefore ideally suited for 3D / depth images. The lens thickness of 864 µ makes this material the appropriate choice for digital short run applications and also for litho offset printing. Surface tension that of natural resin 40 DYNES min. No coating needed.